Mechanical engineering looks at how parts, machines and systems work, and how to design and analyse them. Whether you’re applying the principles to a power station, a car engine or a household object, the emphasis of mechanical engineering is on energy and design. 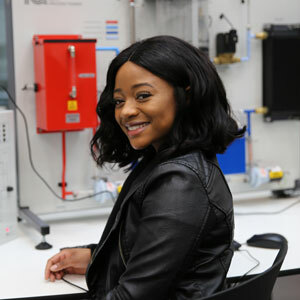 Because it’s so broad, it makes an ideal undergraduate degree – an opportunity to learn about the full range of exciting engineering pathways without specialising too early. The Queen Mary programme has a particular emphasis on design, materials and computational engineering. You’ll start with specialist modules from the first year, while also building a broader foundation of core engineering knowledge. In the third year you’ll choose from topics such as environmental engineering, fluid mechanics, automotive engines and aircraft propulsion. If you choose the MEng option, you’ll take part in a group design project in the final year. Recent projects have included assessing Britain’s Olympic bobsleigh and testing a combustor from a Rolls-Royce micro-gas turbine. This programme is accredited by the Institution of Mechanical Engineers, which means students can progress to chartered engineer status (CEng). What I enjoy the most about my course is that I can apply the theory I learn to real-life scenarios. I’ve always loved physics and maths, and mechanical engineering is the most applicable combination of the subjects.